A brand-new series of Celebrity Antiques Road Show returns to BBC two. 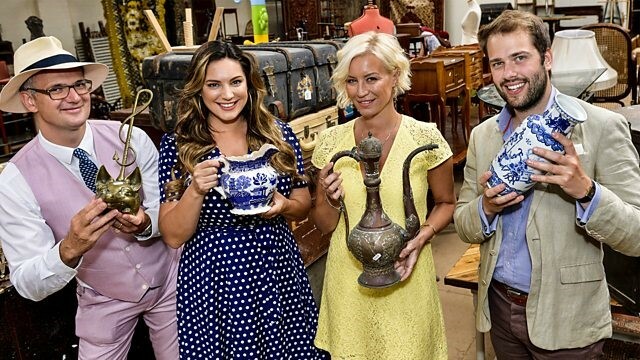 In the programme each antique expert is paired up with a celebrity and they travel across the UK in vintage cars, in a quest to find worthy antiques to sell at auction. The series producer for the upcoming show is John Redshaw, and the chosen stars for series 8 include reality-star Peter Andre, actress Denise Van Outen and model Kelly Brook. One of the episodes visited Kent where the celebrities played mini-golf in Margate, went antiques hunting in the sea-side town of Ramsgate and paid a visit to Leeds Castle and Pleasant View Garden Centre in Maidstone, and Whitstable Harbour in Canterbury. Filming also took place in Faversham and Sittingbourne, which are towns in the district of Swale, as well as further filming in villages Appledore and Chilham in Ashford. Ramsgate, Margate and Whitstable are seaside towns in East-Kent. Ramsgate has been a significant filming location for popular television shows such as Juliet, Naked(2018), EastEnders (2015) and The Apprentice (2015). Whitstable welcomed filming from James May’s Man Lab (2013) and Tipping the Velvet (2002). Faversham and Sittingbourne are both towns within the Swale borough of Kent. Previous productions which filmed there include Celebs on the Farm (20018) and Walks With My Dog (2017). Ashford is a market town with many shops, eateries, and a designer outlet shopping centre with London and Europe are just a train ride away through Ashford International train station. Previous productions which filmed here are The Apprentice (2015) and Country File (2012). Maidstone has been a popular site for TV programmes, productions include Don’t Tell The Bride (2013) and DIY SOS: The Big Build (2013). Tunbridge Wells has also been an attractive location for TV programmes like Question Time (2016) and series two of Hunted (2016). The series will start on Monday 5th November on BBC Two at 7pm with the Kent episode.